Why do you look so dissatisfied with that wall painting? What’s the matter with it, it is not good? Was the story not good for you? 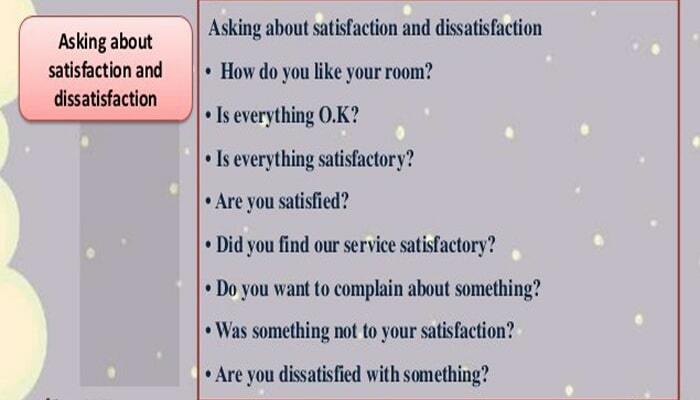 Berikut ini adalah contoh dialog percakapan asking about dissatisfaction dalam bahasa inggris. Vera : Have you ever gone to the Bali with this travel agency? Bintang : Yes, I have. Do you want to use that travel agency? Vera : Yes, I do. Bintang : Don’t you want to choose another one? Vera : Why do you look so dissatisfied of it? According to you, where will Vera want to go? Why did Bintang feel dissatisfied? Who has ever go to the Bali? Leo : I have to give complaint of it. Pury : Do you know the owner? Who is the owner of that shop? What the meaning of “cashier”? Lisa : Why do you move him there? Where is sekar’s father hospitalized? Why did she move him in other hospital ? What is the synonym of “messy”? Johanes : I have ever got in the bus, the condition was so bad. Linka : What is your reasons? What is the synonym of “seat”? Mother : Do you have any recommendation for cake? What will they want to buy? Where did mother want to buy the cake at the first time?